The View from Israel. : The united Jerusalem Delusion by Barry Shaw. Israeli Prime Minister, Benjamin Netanyahu, pledged his support for a Greater Jerusalem bill that would annex places like Maale Adumim, Givat Zeev and villages in the Etzion Bloc and would allow their residents to vote in the Jerusalem mayoral elections. This bill would also create independent municipalities for Israeli-Arabs living within Jerusalem’s municipal boundaries but are located outside the security barrier. But, is Jerusalem united? Let me throw one bucket of icy water over our politicians who are in denial. If Jerusalem was truly the undivided capital of Israel how is it that at least fourteen football clubs, based in Jerusalem, are playing under the auspices of the Palestinian Football Association, headed by Jibril Rajoub of the Palestinian Authority? As these clubs come under the PFA, who is an officer member of FIFA, the world governing body for soccer, these Jerusalem-based clubs are globally recognized as Palestinian, not Israeli. The Israel Football Association lost control of them decades ago. Worse still, some of these clubs promote terror against Israelis as part of their footballing activities, with the full knowledge and approval of Rajoub. Some of these activities are supervised and funded by the PFA. Allow me to offer you one example. 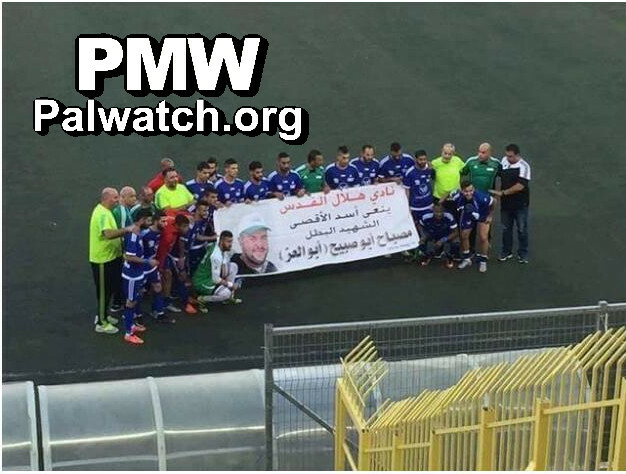 On October 11, 2016, the Hilal Al-Quds (Al Quds means Jerusalem in Arabic) football players and managers took to their pitch and, in front of their adoring fan, unfurled a huge colorful banner carrying the face of Musbah Abu Sbeih, a Palestinian terrorist who murdered two Israelis and injured five others in a shooting attack in Jerusalem two days earlier. Hilal Al Quds are the Palestinian soccer champions. This is the equivalent of having Chelsea, the English football champions celebrate at Stamford Bridge in front of their fans displaying a banner with the faces of the terrorists who carried out their outrage on London Bridge. This would be unthinkable but, in Israel, what Hilal Al Quds did in Jerusalem didn’t produce a murmur of protest from the mayor or our government. This incident is not alone. 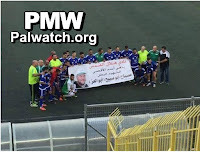 The Al-Ansar football club, also based in Jerusalem, hold an annual soccer tournament in honor of Abu Jihad, a Palestinian terrorist responsible for the murder of 127 Israelis. Again, not a word of protest from our politicians. In Jerusalem, this annual event is supervised and sponsored by the Palestinian Football Association from funds budgeted to them by the Palestinian Authority. A children’s football tournament was named in honor of the Palestinian teenager who went on a knifing rampage through the streets of Jerusalem. Israeli lives have been lost partly from terror-promoting propaganda being pumped out at Palestinian sporting and football events in Jerusalem. Policewoman, Hadar Cohen, was killed while on duty outside the Damascus Gate in Jerusalem by the captain of a Palestinian football club. There are many such Jerusalem-based terror incitement outrages that go unchallenged by the politicians that talk about a united and undivided Jerusalem. As part of a group of NGOs based in Israel, London and New York, we have been campaigning to FIFA to address the issue of the promotion of terror in Palestinian football. Sadly, I have to report that government ministries, the Prime Minister’s Office, and even the Israeli Football Association refuse to respond, or to address this troubling phenomenon in Jerusalem. So let not Minister Hotovely, nor Mayor Barkat, and not even Prime Minister Netanyahu, claim that Jerusalem is the undivided capital of Israel. You lost control of Jerusalem years ago to our security cost, and the loss of too many lives.